6 Jesus left that part of the country and returned with his disciples to Nazareth, his hometown. 2 The next Sabbath he began teaching in the synagogue, and many who heard him were amazed. They asked, “Where did he get all this wisdom and the power to perform such miracles?” 3 Then they scoffed, “He’s just a carpenter, the son of Mary and the brother of James, Joseph, Judas, and Simon. And his sisters live right here among us.” They were deeply offended and refused to believe in him. 4 Then Jesus told them, “A prophet is honored everywhere except in his own hometown and among his relatives and his own family.” 5 And because of their unbelief, he couldn’t do any miracles among them except to place his hands on a few sick people and heal them. 6 And he was amazed at their unbelief. Then Jesus went from village to village, teaching the people. 7 And he called his twelve disciples together and began sending them out two by two, giving them authority to cast out evil spirits. 8 He told them to take nothing for their journey except a walking stick—no food, no traveler’s bag, no money. 9 He allowed them to wear sandals but not to take a change of clothes. 10 “Wherever you go,” he said, “stay in the same house until you leave town. 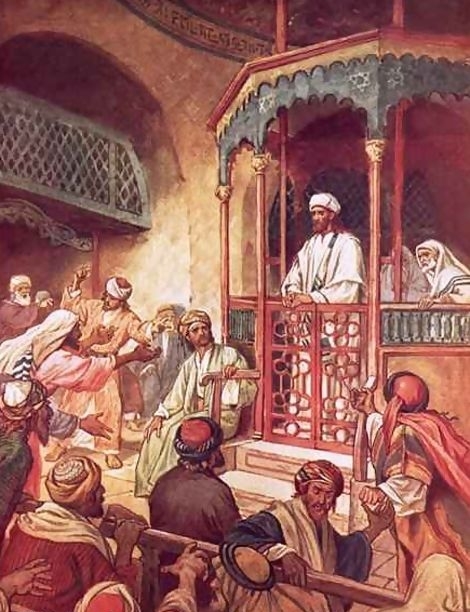 Jesus teaching in the synagogue and being rejected. Don’t ever let someone tell you God won’t/hasn’t/can’t heal you because you don’t believe. Don’t let them tell you that your lack of healing proves your lack of faith. That is not true. Jesus raises people from the dead. Not much faith happening in a dead person, is there? Don’t expect to see much in the way of healings or deliverance if you are hanging out with people who don’t believe such stuff happens. Faith does matter. Their collective lack of faith does inhibit what God is able to do in the confines of that community (yes, I meant what I said again). I’m not a big fan of church shopping, but I highly recommend you find a community of faith that believes, seeks, and practices letting the power of God flow for healing, for deliverance, for the sort of life change that Jesus has been bringing since way back when. He still heals. Believe it.